Some people don't even have to try. Walking home from an impromptu photo shoot, I spied this wonderful creature walking down my block. I wanted to stop her and ask to take her picture, but I got kind of shy, like, why would she agree to let a stranger photograph her? I must have been walking a little to briskly at her heels, because she suddenly looked back at me and scooted over to let me pass her. 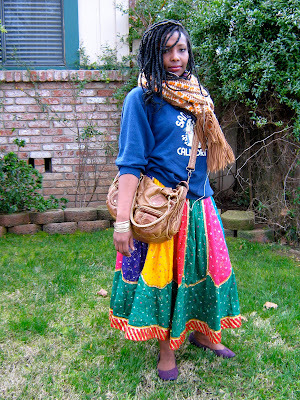 She had such a great expressive face and looked so stunning in a colorful gypsy skirt, knit scarf and sweatshirt, that I worked up the courage to ask for her picture. She was game, and we stepped over onto the nearest lawn and I snapped exactly 5 pictures. All of them were flawless. She was relaxed, poised and made a perfect subject. Seriously. Not a bad one in the bunch. No retouching or tweeking in editing, just some simple glorious pictures of joie-de-vivre. She literally threw her outfit on this morning to make it on time for work. You might guess she's artistic, and she is. She knit her own scarf and loves crafts. Her name is Vocheri, by the way, and I am definitely planning to shoot her again, next time, hopefully as a Citizen Rosebud model. If Ms V looks this amazing rolling out of bed in the morning, I am curious as to how stunning she'll be all dolled up! Beautiful, beautiful woman! I really enjoyed these pictures. She really is. Simply. Stunning. Awesome post! Gorgeous model, beautiful pictures! What was your impromptu photoshoot for? Ha, ha Emma, I don't look that good either, even when I take time and get all dolled up! She just looks good, and her energy seemed equally so, such a chill, positive vibe from her- like sunshine! @Emily: the impromptu shoot was an attempt to chronicle a "What a Wore Today" outfit. I think I'll be posting it tommorrow. absolutely stunnning! what a multitude of colors! so optimistic! She is just a well of artistic inspiration! 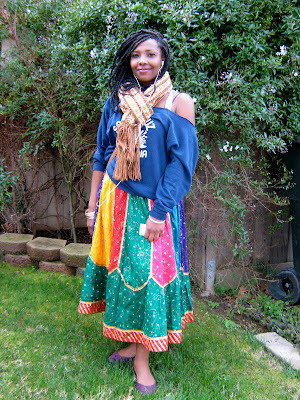 you are right, she's stunning, loved that skirt. and loved your blog too! 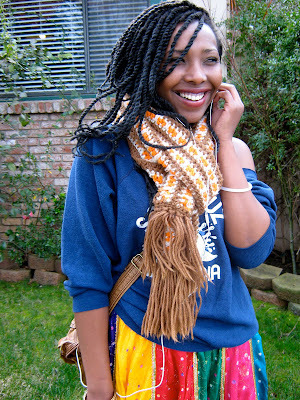 that skirt is stunning, and i love how shes paired it with a sweatshirt and a beautiful scarf! I love all of that color! Even though I would never wear it . . .